If you are planning a company event this year then you’re probably finding that you have plenty of things to organise and lots of decisions to make – We can help. You may need to set up and manage an invitation process for attendees, guests or delegates; you might need to consider where they will stay, organise their accommodation and think about how they will travel to the event. You’ll probably have a strict budget to adhere to too. It can be a stressful experience so you’ll want to plan methodically and take care to do things in the correct order. 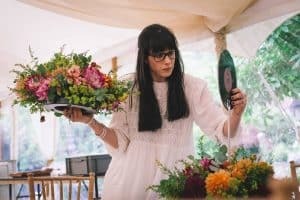 It’s very easy to get stuck into the fun bits such as organising a band, the catering, and the bar – but before you get carried away with the details you’ll want to give your event some solid foundations to build on. 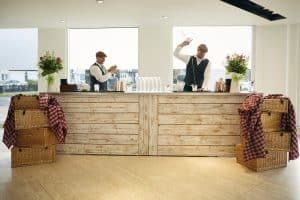 Perhaps you’re considering a traditional bricks and mortar venue, or perhaps you are looking to create something bespoke – a unique venue in which to showcase your brand? The importance of the venue is often overlooked, yet it’s the likely to be one of the first things an invitee will notice and it could have a huge impact on their decision to attend – or not. Whether it’s a product launch, promotional event, exhibition, conference, AGM or meeting, a family fun day, summer office party, Christmas party or even a retail extension – we have the experience, industry contacts and partners to help you make it happen, and to keep it on brand too. We understand brands and have the experience and products to ensure that your brand is represented accurately and to the highest standards. 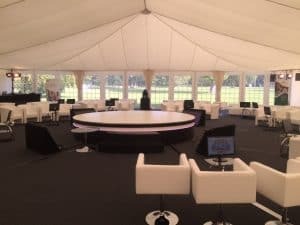 We not only offer a high quality marquee structures with an impeccable level of finish, but can also organise everything else you’ll need to create the perfect temporary venue for your event. We can provide branded marquees and additional branded materials, furniture, bars, dance floors, stages and platforms, portable luxury toilets and all of the lighting, heating and power that you’ll require too. We offer a choice of flooring, from raised wooden flooring with carpets to simple matting. We can create separate areas within our marquees too – meeting rooms, breakout areas, auditoriums for presentations, catering areas and more. Best of all we take a consultative approach, listening to your needs before guiding you through the entire process to ensure that it is as stress free as possible. 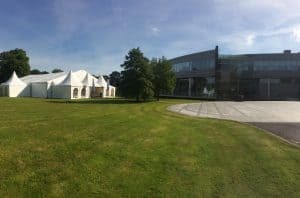 Venues – Where should you put your marquee? 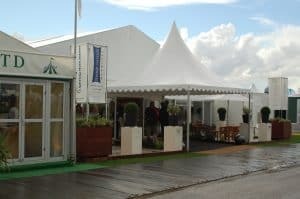 If you are considering holding your event in a marquee then you’ll need a place to put it. We can build a marquee at your premises or at a venue of your choosing. We are happy to recommend a number of superb venues via our supplier directory or over the telephone should you need help in selecting one. The most cost effective way to host a marquee event is to build it at your own premises. This way you’ll save an additional venue hire costs. We can build on hard ground such as car parks or on soft areas such as lawns – we’ve even built marquees inside warehouses. If you think that your space may be a little awkward for a marquee then please speak to us before dismissing it as a potential marquee location. We have built on sloping land, over tiered terraces and even or lakes and swimming pools – creating marquee solutions for awkward spaces is what we enjoy the most. 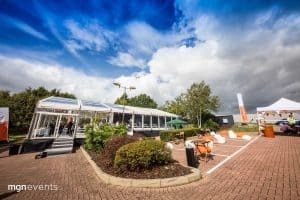 Consider the location carefully against the type of event you are running – a marquee built on your car park within an industrial estate may be perfect for a team building day, or even a technical product launch. However, if you are a high end brand launching a premium product to a discerning consumer audience then you might want to consider hiring land at a venue that matches your product and brand aspirations. We know a large number of venues and are happy to help with recommendations and introductions. We’ve been creating amazing marquees for nearly 40 years and in that time we’ve met and built relationships with some incredible suppliers. Take a look at our comprehensive supplier directory where you’ll find information on a whole variety of suppliers from catering companies to bar suppliers, florists, entertainers, photographers and more. Tell us what you are planning and we can recommend a supplier that we know and trust and that we believe will deliver an outstanding service to meet your events brief. By trusting Inside Outside to supply your marquee you can relax and enjoy the entire process. Allow us to do the heavy lifting and not only will we supply an incredible marquee and guide you to some great suppliers, but (regardless of whether you use one of our recommended suppliers or not) will also keep in close communication and work with them to ensure all of the logistics are taken care of – so that you don’t have to. We’ll manage the build schedule and liaise with third party suppliers to ensure everything runs smoothly up until the point that the marquee is built (and again when we are taking it down) but we won’t be there on the day to run the event for you – that’s a step to far, even for us! However, we work with a variety of great event management companies. You can find some of them listed in our supplier directory, but please feel free to contact us and tell us about your event so that we can recommend one that we believe will best suit your needs. We supply premium quality marquees and a premium level of service too – marquees are available at all price points, but you really do get what you pay for. Your marquee venue will represent your brand so be careful to ensure that you look at the bigger picture and not just the price tag when selecting suppliers for your event. Read here how Inside Outside were called in to rescue a major brand’s reputation after their event management company dropped the ball on matching marquee supply to brand identity. Looking to create a Guaranteed Stress Free Event? 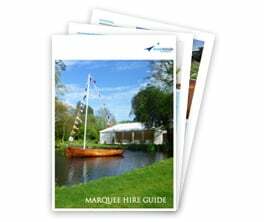 We love marquee events and are more than happy offer advice and assistance – We also offer a 10 Point Stress Free Guarantee. Visit our Corporate Marquee Hire section for more information and please contact our team for a chat and a free, no obligation quotation.